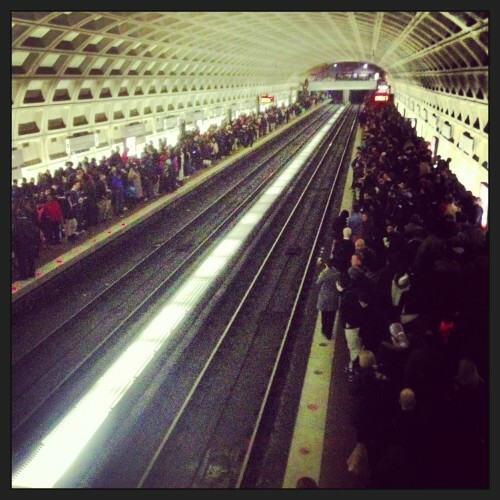 If Metrorail seemed a bit busier than usual yesterday, it wasn’t your imagination. Wednesday was the fourth busiest day in the 37-year history of Metrorail. Based on preliminary data, the system provided a total of 870,171 trips between 5 a.m. and midnight. Metro officials attributed the especially busy day to the combination of Cherry Blossom visitors, a Nationals game, a Wizards game and a rally at the US Capitol. It was the system’s highest ridership day since April 2, 2010. Metro General Manager and CEO Richard Sarles noted that growing ridership only increases the urgency of expanding the capacity of the system. Earlier this year, Metro unveiled its strategic plan — called “Momentum” — to expand the system’s capacity and better serve the region’s future needs. Among the projects set forth in Momentum are power upgrades, additional rail cars and new yard storage to support running 100 percent 8-car trains. All of Metro’s top-10 ridership days have occurred in the past five years. Today could also see higher ridership, with favorable weather, the Cherry Blossoms in bloom, a Nationals game at 7:05 p.m. and a Capitals game at 7:00 p.m. As a result, riders may experience more crowded trains and stations during this evening’s rush hour. Metro will provide extra Green Line trains between Mount Vernon Square and Anacostia stations during rush hour to accommodate baseball travel.